BRISTOL - There was never a doubt who would be on the mound for the Bristol Blues in the team’s biggest game of the season. As the Blues took the field Monday in a single-elimination playoff game against the Pittsfield Suns, it was left-hander Michael Genaro taking the hill for Bristol. For Blues manager Ronnie Palmer, Genaro was the only man for the job. Having the opportunity to be “the guy” on the team is what Genaro has worked all season for. Genaro earned the recognition throughout the season as the team’s best and most consistent starter. In 10 starts this season, Genaro has a 3.57 ERA in 57 innings. His most impressive stat is that he walked just eight batters in those starts, giving him a WHIP of 1.13. That mark is the third best among all Futures League pitchers with at least 40 innings on the mound. Put simply, Genaro is the closest thing a manger can have to a sure thing, especially at the collegiate baseball level. 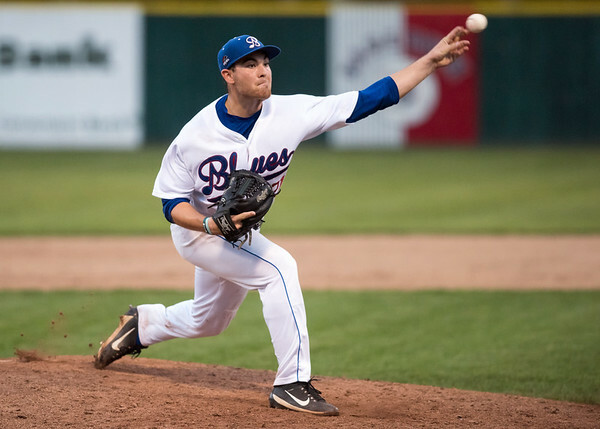 The southpaw believes his track record and experience with the Blues made the job easy for the coaching staff, especially on a team with many pitchers going in and out of the rotation this season. Palmer believes his starter’s biggest asset isn’t necessarily his performance on the mound, but his attitude off it. He sees it as a sign of the person Genaro is, but also the quality of his coaching staff at Babson College. Genaro won’t get another start for the Blues this season unless they get by the Worcester Bravehearts to make the championship series. If he does take the mound again for Bristol, he will have a great chance to give the Blues another playoff win. Posted in The Bristol Press, Bristol Blues on Wednesday, 8 August 2018 19:14. Updated: Wednesday, 8 August 2018 19:16.